On Saturday the 28th April a large crowd gathered at Potarch Cafe & Restaurant to witness a group of individuals attempt to lift the historic 'Dinnie Stones'. Out of a group of eight potential lifters, four successfully lifted the stones: Charlie Blair Oliphant, Liam Tweedie, Jamie Gorrian and James Crossley. To lift the Dinnie Stones is an exceptional challenge and combined they weigh in excess of 332Kg; there are still under 100 individuals who have lifted these stones since Donald Dinne, so, these gentlemen join an exceptionally elite group! James Crossley also went on to break the current record for a lift and hold by raising the stones into a locked lift and holding fast for 34.58 secs, beating the previous best time of 33.9 secs held by Bryan Hunsaker from Salt Lake City, Ohio since March 2017. 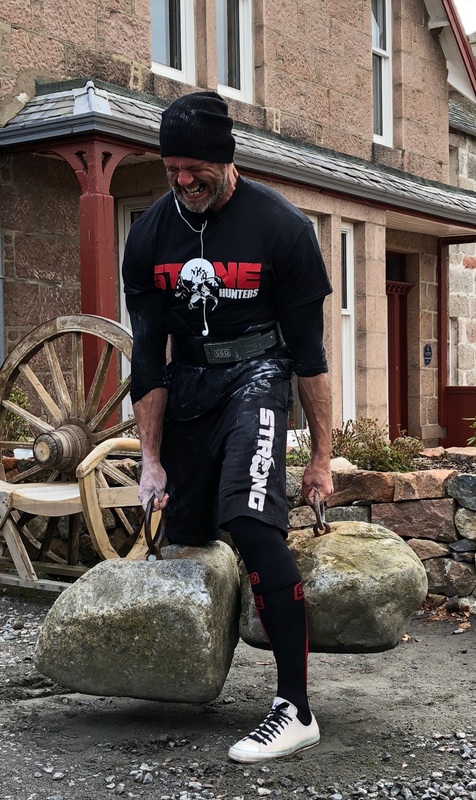 James had trained for several months and was determined to break the record; he stuck to a special training schedule and trained with replica Dinnie Stones in his local gym. He showed exceptional grit, determination and inner strength to complete the challenge and be the new official record holder - Congratulations James!